NOTE: Flickr has updated their API to force safely use SSL, so it has stopped working on implementing this feature. We're working to fix it, but will need to upgrade to Windows phone 8.1. 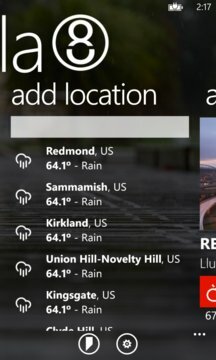 Umbrella 8 is a weather forecast application for Metro UI interface. Its main feature is the photo download depending on your weather forecast, thanks to Flickr Weather project. - Realtime forecast for your current location. - Beautiful Flickr images from every world location depending theirs weather. 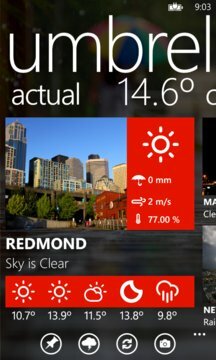 - Live tile with weather's info and the forecast image. - Supports wide live tile. - Supports the background image and notification at the lockscreen. - Background agent to update your forecast. - Supports English and Spanish languages. - Allows searches of cities near your current position. - Supports dark and light themes. - Upload custom weather images to Flickr. Please report the bugs or improvement requests to codellion@outlook.com. Those who want to help translate please contact me. - Fixed the corrupted data error when opening the application while the agent was running in the background. - Added the regular time option. - Added the wind direction in the detail of city with a compass sensor. - Fixed some bugs of the data cache. - Added the possibility of show the pressure in millibars. - Weather for route plan of the travels.